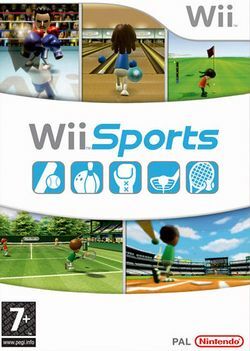 Wii Sports is a collection of simplified sports games for the Wii that employs the Wii controller to mimic a real-life action such as swinging a golf club. It was packaged with the console itself at launch (except in Japan). The point of the game is mainly to demonstrate how the new control system can work for a variety of different games and get new users used to the controls using simplified mini-games. However, it is also a very playable sports game with reasonable depth. There are five different sports to play, in either single-player or multiplayer modes. These are Tennis, Baseball, Golf, Boxing and Bowling. The games are little more than mini-games but extra depth is added by the inclusion of Skill Levels for each player. Players can increase their Skill Level rating in each sport by defeating computer opponents. When a player's skill level reaches 1000 or higher they achieve pro status in that sport. Aside from the five main games there are also the Training exercises and the Wii Fitness mode, which add further depth to Wii Sports. In Training mode there are 3 different exercises based on each sport and players aim to achieve a Gold Medal in each exercise. In Wii Fitness, the computer randomly selects three training exercises to test a player's skill and gives them a "Wii Fitness Age". The intention is that player use this function every day to monitor their Wii fitness age, in much the same way as Brain Training on the Nintendo DS does for mental agility. This page was last edited on 12 May 2013, at 10:14. This page has been accessed 108,942 times.